PakWater Care Services Offers World Latest Technologies of Process for Mineral Water (Bottled Water) Production from Different Source of water Like Bore Hole, Deep Well, River Water, Sea Water etc. Water is passed through following different stages for process of filtration & separation in packaged drinking water plant process. Manufacturing Mineral Water i.e. water containing sufficient/required quantity of minerals which is required to human bodies. Remove suspended matter from the water. Remove Color, Odor and Smell from the water. Remove Oil & Grease from the raw water. Control the BOD & COD in the raw water. Remove Hardness Minerals from Feed Water which would otherwise cause Mineral Deposits [scale] within the Water Purification System. Remove 1-5 micron particles from the raw water. To create osmotic pressure in raw water. To desalt the raw water i.e. to reduce total dissolve solids. To adjust the minerals contains in the Process water by means of mixing of raw water in the desalted Treated water, Due to proportionate mixing Required quantity of raw water, we can mix to get required Quantity of ions from the raw water to desalted water. Remove back pressure in R. O. Membrane elements. To kill the bacteria from fine water. Prevent the biological & micro organism growth in the stagnant water. To filter water from 1 micron to 0.2 micron rating & achieve the crystal clear filtered mineral water. To rinse, Fill & capping of the bottle of mineral water. To manufacture the PET bottle from Pet granules. To clean the membrane when it comes in maintenance stage. Packing of mineral water in Bottles, container or poly pack. To pack the final production in the selected packing to sell it in the market. 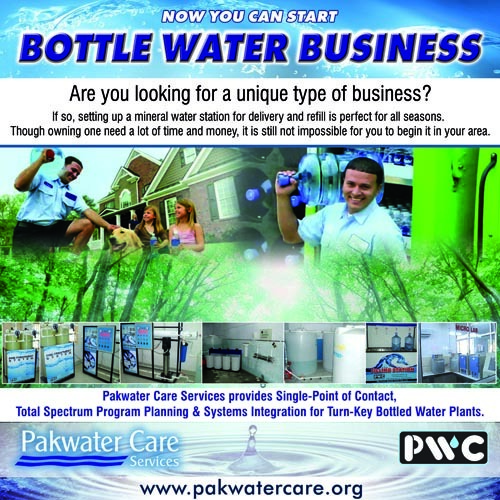 PakWater Care Services, Complete turnkey Solution for Bottle Water or Mineral Water Business in Pakistan.